Today, the Romanian Film Festival in London screened the incredible Everybody in Our Family by Radu Jude, a film that on the one side keeps you on tenterhooks, and on the other side makes you swing from being sceptical as to the actions of the characters on screen to being appalled as how this “dramedy” (as described by critic David Parkinson for Empire Online) plays out. 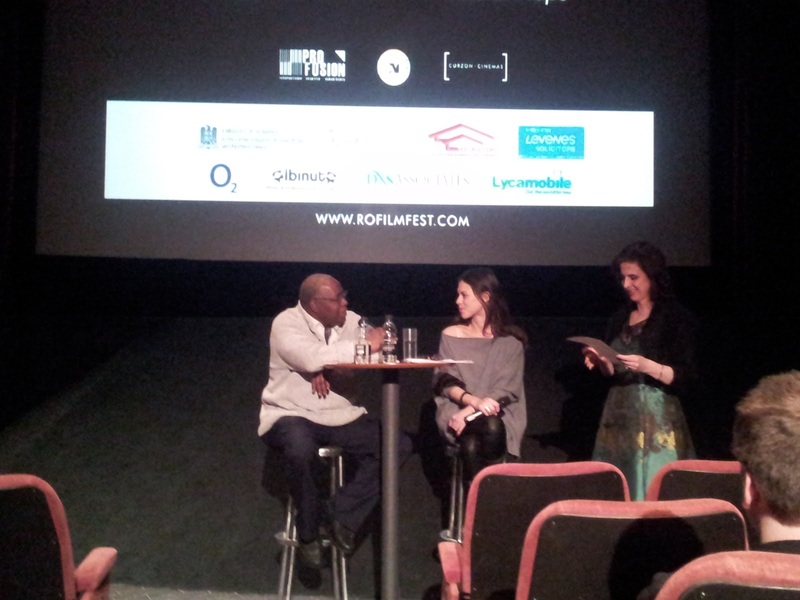 The film was followed by a Q&A with the lovely and talkative actress Mihaela Sirbu, led by Ramona Mitrica (Festival Director) and Mike Phillips (Festival Consultant). Afterwards, everybody in our Festival moved to the Embassy of Romania for a reception hosted by His Excellency Dr Ion Jinga to honour the Festival Guests and celebrate the success of Romanian cinema in Britain and elsewhere. A big thank you to the sponsor of the reception, the online Romanian food shop Albinuta.co.uk – the food and drinks were fabulous! Then, there will be only Monday, when the Festival will close with the special screening of Medal of Honour by Calin Peter Netzer at the EBRD, with star actor Victor Rebengiuc in attendance. And there was Day Two! 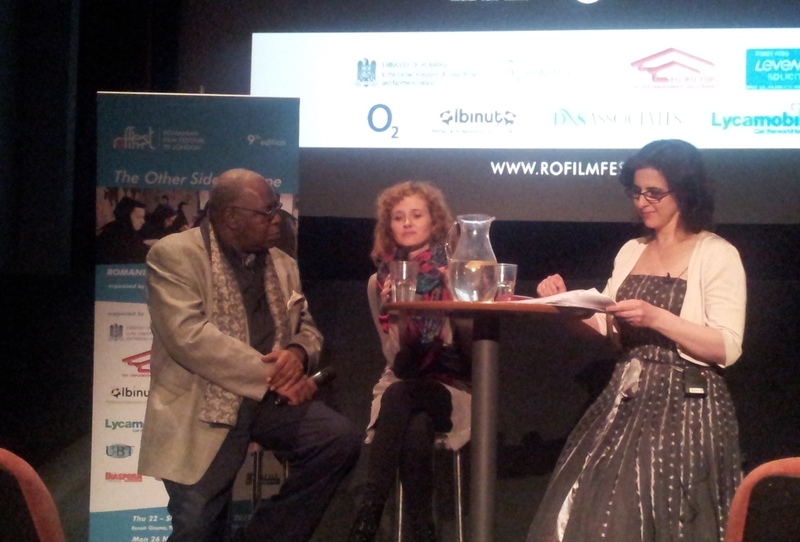 On Friday the Romanian Film Festival in London screened Constantin Popescu’s family drama Principles of Life, a story I believe to be stunning in its cleanness of expression and image. 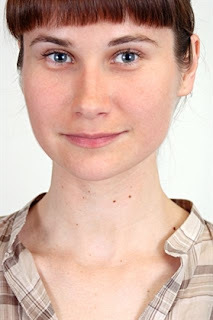 The film was followed by a Q&A with lead actress Rodica Lazar, who was perfect as the counterpart of Vlad Ivanov’s cuddly-looking but heavy-handed Emilian Velicanu. In an interested and animated discussion led by Ramona Mitrica (Festival Director) and Mike Phillips (Festival Consultant), Rodica Lazar talked about some of the issues presented in the film. She also talked about her experiences while filming Principles of Life, and about her future projects. Day Three of the Festival brings the screening of another family-related film – Radu Jude’s Everybody in Our Family. See the trailer below. You are more than welcome to join us for this screening, as well as for the last film in the programme presented at Renoir – Periferic by Bogdan George Apetri. We are joined for the Q&A session by actresses Mihaela Sirbu (on Saturday for Everybody in Our Family) and Ana Ularu (on Sunday for Periferic). 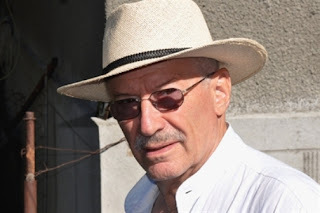 I am happy to say that the Festival Connected Event of Monday 26 November, the screening of Medal of Honour by Calin Peter Netzer, in the presence of maestro Victor Rebengiuc, is now sold out. (I’m also a little sad because many of our friends will miss on meeting and honouring this superlative Romanian actor). 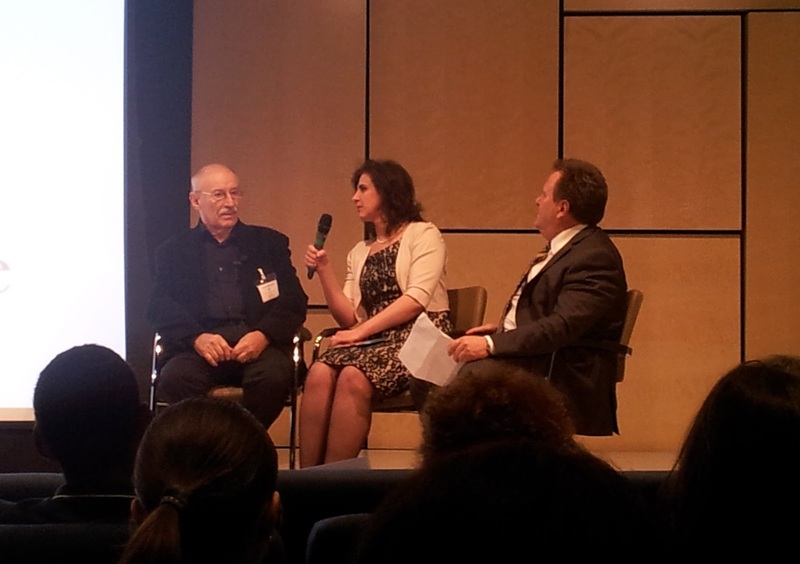 Here we are at the start of The Romanian Film Festival in London, the ninth edition. It is happening again, folks, and I have to say this Festival’s started with flying colours. I do believe Beyond the Hills is an extraordinary film, and I think the audience are of the same opinion. 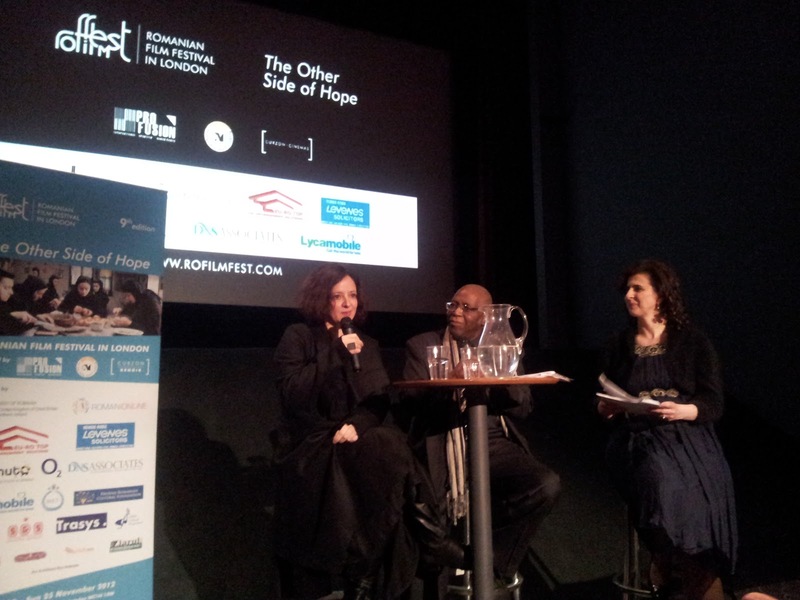 The screening was followed by a lively Q&A with Cosmina Stratan and Cristina Flutur, led by Ramona Mitrica (Festival Director) and Mike Phillips (Festival Consultant). 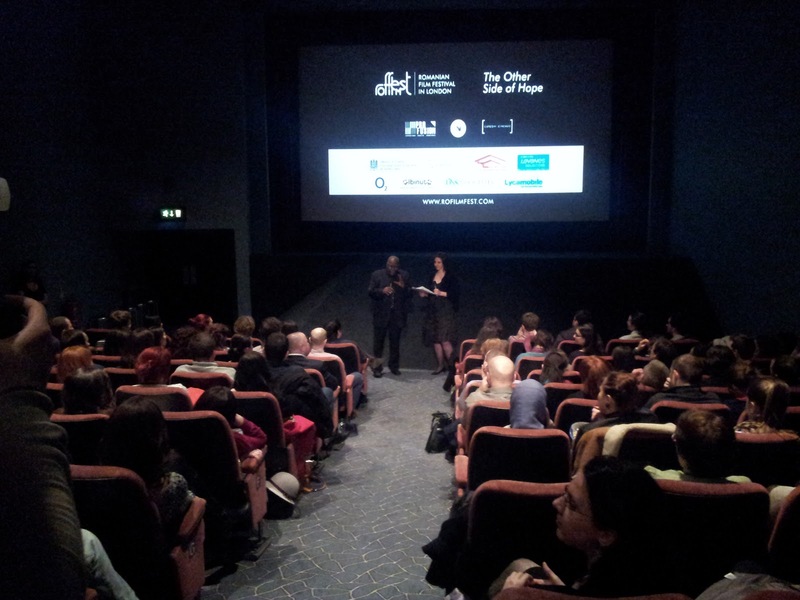 A very, very big thank you to everybody who came to the Gala Screening - your interest in Romanian film is much appreciated. 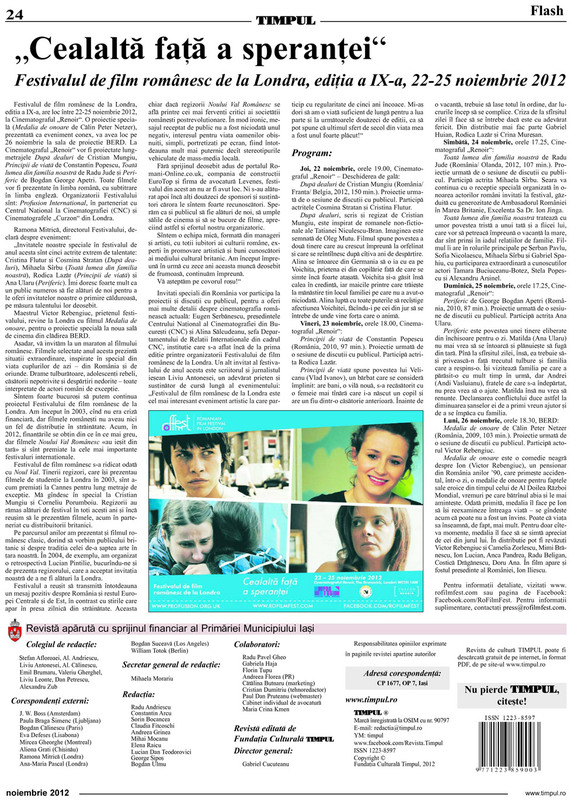 In other news, we've already made it into the newspapers in Romania. We are currently occupying the full page 24 of the respected Timpul arts magazine. T minus 1, folks! 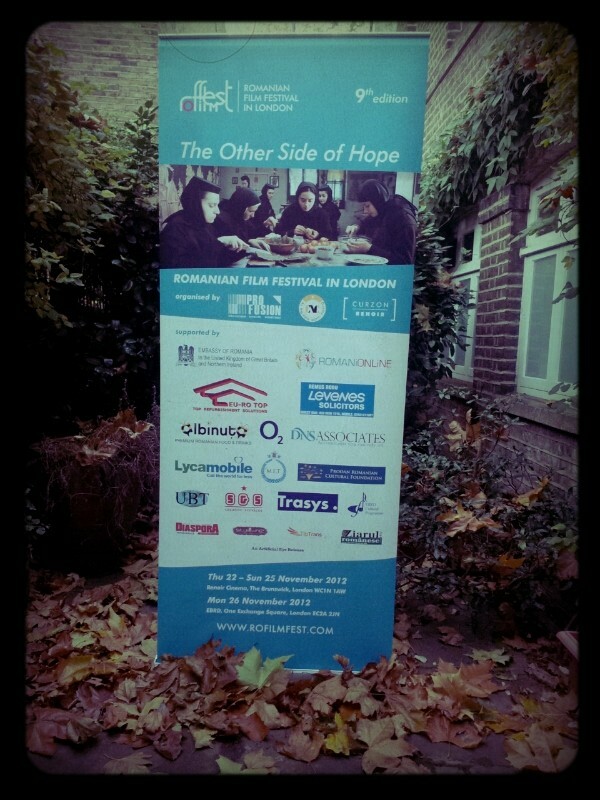 And the first Festival Guests are already in London. Nothing says you’re actually starting a Festival better than the arrival of the first guests. This morning, we had the pleasure to receive the Cannes 2012 award-winning actresses Cosmina Stratan and Cristina Flutur, as well as the President of the National Centre of Cinematography, Eugen Serbanescu. 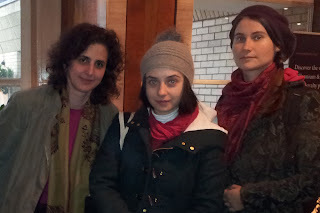 I could not miss the chance to snap a photo with the two Festival Guest Stars in the hotel lobby. 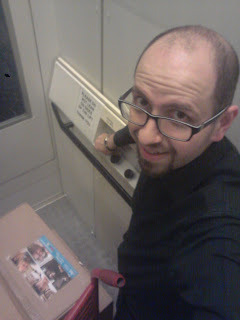 Soon after this, we went back on the less glamorous side of event organising. In short, we did a spot of physical labour and assembled all the materials needed at the cinema in the following days. It's so fun to be in a lift with a couple of very heavy boxes. 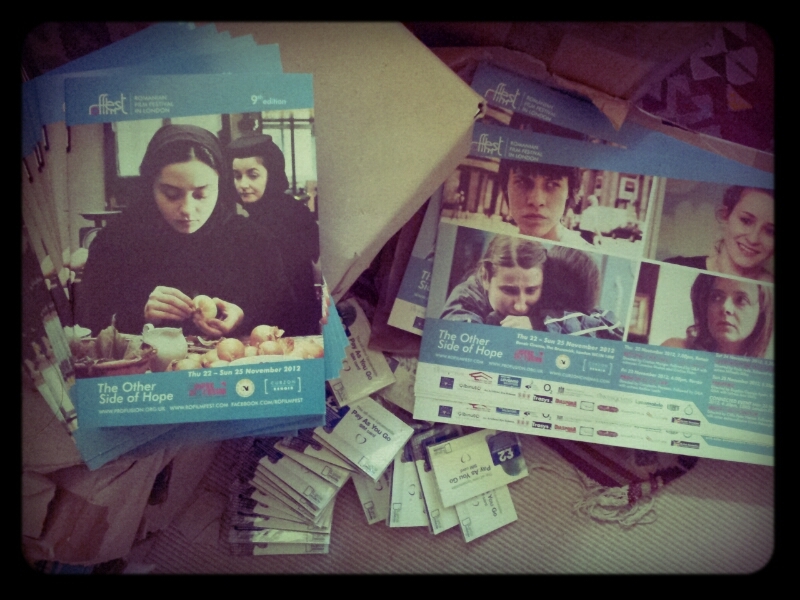 There’re so many of them, not least the Festival Goody Bags. Not only do we have various promotional gifts from our sponsors, but the bags are also filled with love. This edition of the Festival, like the others before it, is nothing if not a labour of love. I should actually say love and admiration for the superlative achievements of Romanian film directors, actors, editors and producers, who created some of the best cultural exports the country has ever produced (or at least that’s my personal opinion). We also did some shopping for the Festival Reception. No efforts were spared, and we came out in force, also bringing our little helpers with us. We are looking forward to welcoming more special Romanian guests tomorrow - not to mention our audience for the sold out Gala Screening of Beyond the Hills by Cristian Mungiu. As an aside – London is a very competitive arena for international film screening, and a sold out screening is something to be proud of. There is so much choice here for the cinephile, with many national film festivals going on this November: French, Czech, Irish, Iranian, Latin America, African, Jewish, Korean. There is also the Nordic Film Festival, which starts on 30 November, bringing some of the best productions from the Scandinavian countries. After our Festival, this looks like a good choice for the lover of cinema of the highest order. I can’t help myself, I just have to say this: OMG! OMG! We have the most beautiful pens and bags EVER! (apologies for getting over-enthusiastic about things). 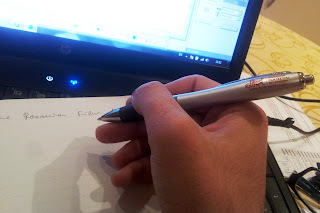 The Festival Pens are nice, ergonomic and they write in black ink. They also sport a beautiful logo on a side. It’s an absolute pleasure to write with them, really. I might just start a diary so I can use them for other tasks than jotting down names and phone numbers, or checking guest lists and flight schedules. Then there is the Festival Bag, a marvel of portable technology that is ecological and easy to wear. Not to mention it is also hip – as can be seen in picture. I imagine fashionistas would love to get their hands on one of them. But no – they are for our lovely audience. Changing the subject – this evening I had the pleasure to see the extraordinary film director Andrei Konchalovsky, at a special screening of his film Gloss in the EBRD Auditorium, in the heart of the City. This will be the precise place where we’ll host actor extraordinaire Victor Rebengiuc on Monday 26 November for a screening of Medal of Honour. It will be so exciting to meet this extraordinary man again, and to be able to rub shoulders with one of the best-known and loved Romanian actors. In a career spanning more than 50 years, Victor Rebengiuc has worked with all the greats of Romanian cinematography - such as Liviu Ciulei, Lucian Pintilie or Dan Pita - while also working for younger directors such as Cristi Puiu, Radu Muntean, Lucian Georgescu, or Calin Peter Netzer. European Bank for Reconstruction and Development (EBRD), One Exchange Square, London EC2A 2JN (Tube: Liverpool Street Station). It would be handy to have some kind of ID with you, to enable the EBRD staff process your entrance pass faster. The screening is preceded by a drinks reception from 5.30pm - all invited. Oh, I nearly forgot - the Festival starts in TWO days! Monday, 19 November 2012. Three days left to the start of the Festival, and we are checking the final details on the guest lists, rehearsing the events, making phone calls, sending e-mails... And deciding on the menu for the private Festival Reception (yum yum). It was also extremely nice to take another look (this time in daylight) at the canopy of the Renoir cinema. 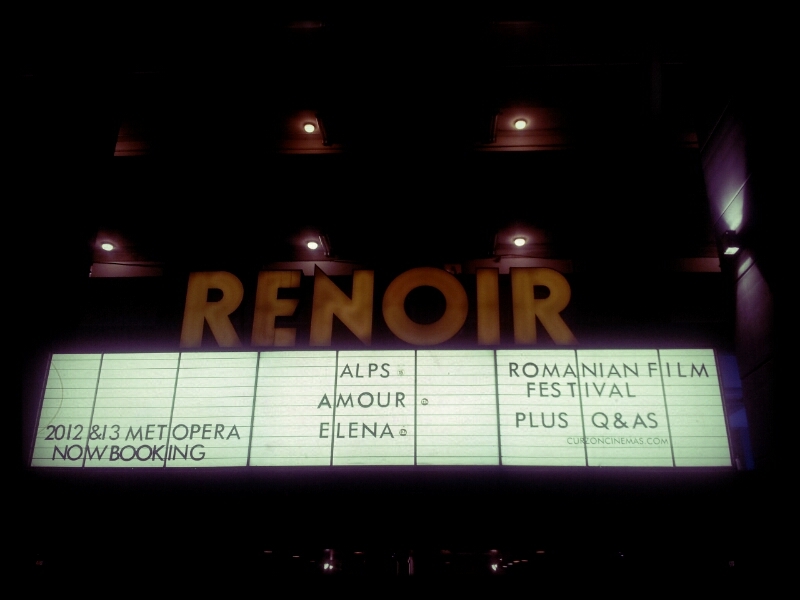 It feels pretty satisfying to see the words ROMANIAN FILM FESTIVAL written in very large letters on a cinema front. 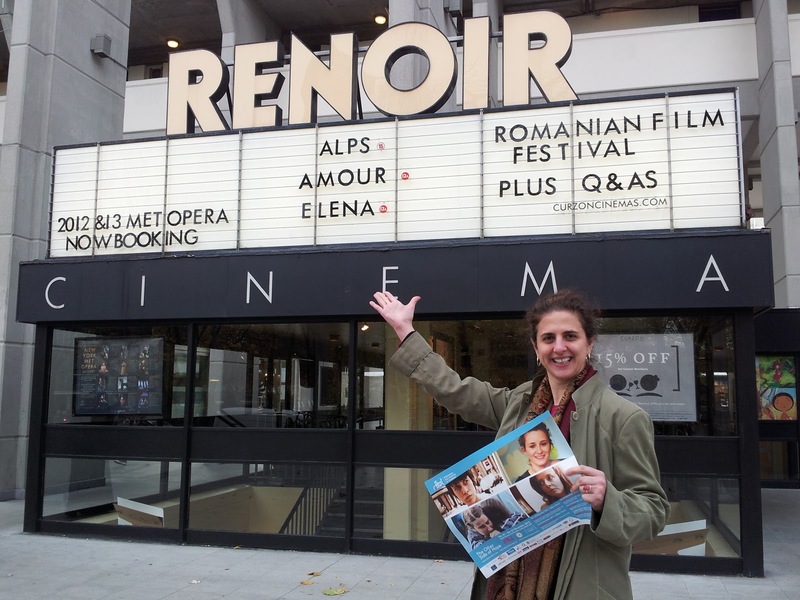 Ramona Mitrica, Festival Director: "Ladies and gentlemen, I give you the Romanian Film Festival at Renoir Cinema!" 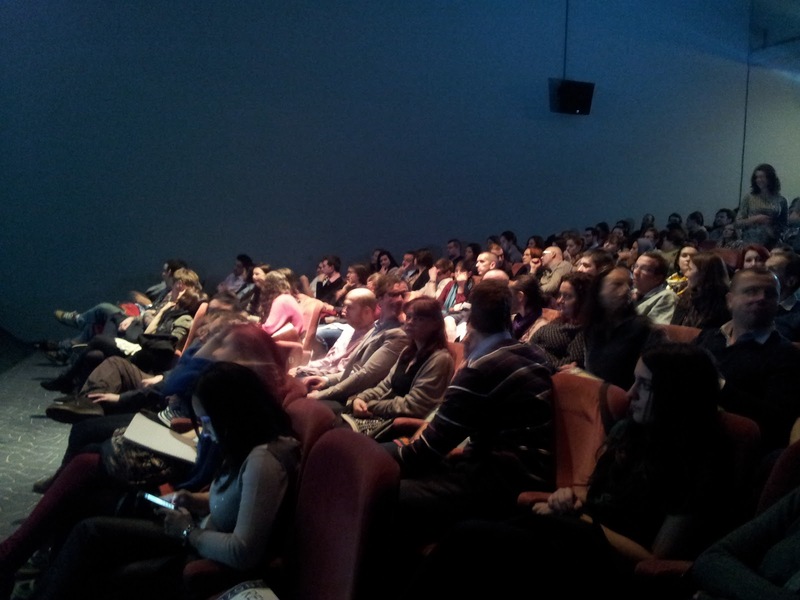 We also test-screened the 35mm copy of Principles of Life – such a great movie, to watch and re-watch. It will be screened on Friday 23 November, at 6pm. Actress Rodica Lazar, a superlative companion to Vlad Ivanov’s main character Emilian Velicanu, will be with us for the Q&A after the film. Otherwise, I can say we are all looking forward to the beginning of the Festival. Our special guests from Romania will start arriving very soon, and we’ll kick off yet another showcase of the best Romanian films around. In the end, I'd like to assure you that I didn’t mention the Festival Reception for nothing. Yes, it is a private and EXCLUSIVE event. But we do love you, our audience, very much. That’s why we would like to give you the chance to come and rub shoulders with the Romanian movie stars we invited to London this year. Send proof of payment to press@rofilmfest.com before 6pm on WEDNESDAY 21 November, and you will be entered in a special raffle. The winner will be notified in writing soon afterwards. Good luck! Here's another treat for you from the Romanian rock band Compact - watch out in Principles of Life for an unleashed Vlad Ivanov dancing in the kitchen to this tune (dressed only in a towel). Director Constantin Popescu said in an interview this was the only scene in the film which was improvised (full interview here). AMR 3 Days - acronym meaning “still 3 days left”. AMR stands for au mai rămas – “still left”. Soldiers and their relatives marked the time left on calendars with AMR followed by the number of days. I am proud to say the Romanian Film Festival is an event that manages to dynamise so many members of the UK Romanian community. Among our sponsors and supporters we count UK-based Romanian businesses, websites and media, all helping to spread the word about the exciting films and guests. I like to believe that people come together on these occasions because they too feel proud of the achievements of Romanian cinema and want to honour them, and to make sure Romanian actors and film-makers get the recognition they so fully deserve. I also believe that people like the fact that Romanian cinema is an international success story. In contrast to the overall tone of recent media coverage in Europe, the films being screened are among the few positive contributions to images of life in Eastern Europe, and provide some of the best PR available. We have prepared press releases and materials in Romanian for the Romanian media, but also for the festival’s own website, www.rofilmfest.com. 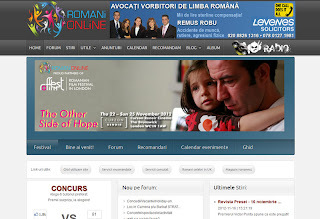 … and ROMANi-ONLiNE.co.uk, the best and most popular Romanian community portal published special banners and ads, and sent our press releases to their members and friends. 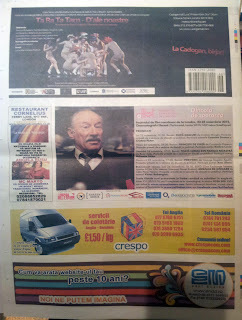 The online shop Albinuta.co.uk, a very dear Festival supporter, also sent our press releases to their subscribers. 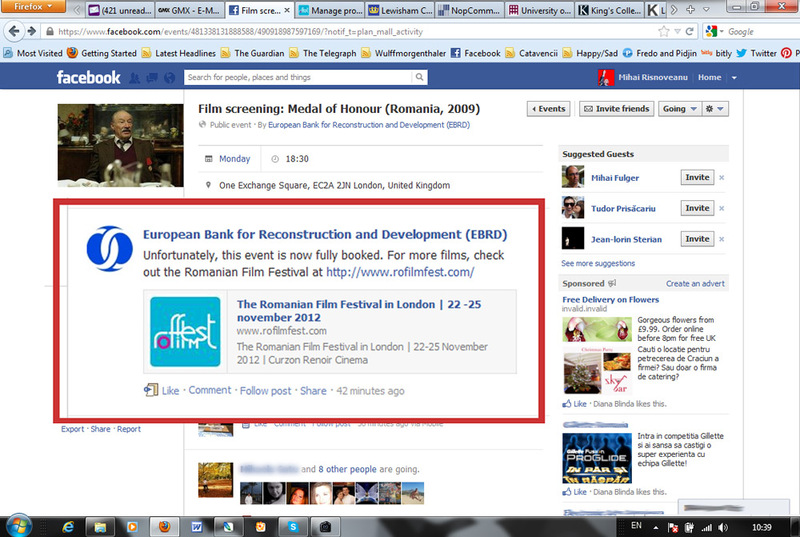 There are many, many other publications - British and Romanian (and not only) - that mentioned the Romanian Film Festival. We have included a list of links on our website: www.rofilmfest.com/c/22/links The list is by no means complete, so, if you find other references, you are welcome to send us an e-mail with the links you discovered. While you are at it, please take a look at the full Festival programme. See you on the red carpet, folks! 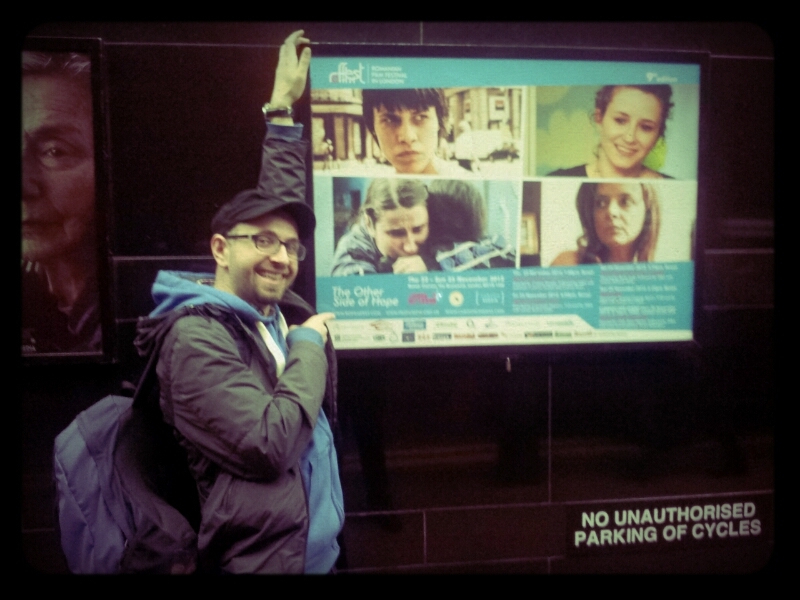 There’s no rest for the wicked – or for the organisers of a film festival. But we’re so excited about this year’s Festival that all the work pales into insignificance. In case you didn’t already know this year’s edition of the Romanian Film Festival in London will welcome to London very exciting special guests, this is the time and place to be informed of it. 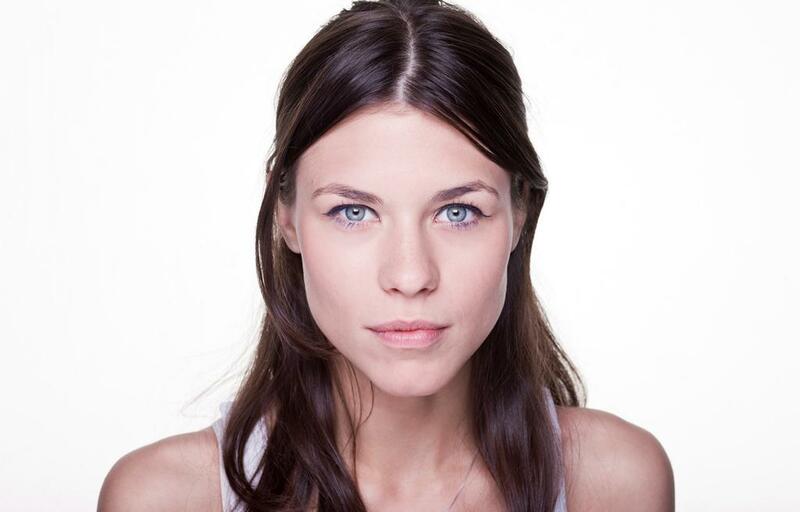 and the amazing Ana Ularu from ‘Periferic’. You will have the chance to meet them all and talk to them in the Q&A sessions following each screening. 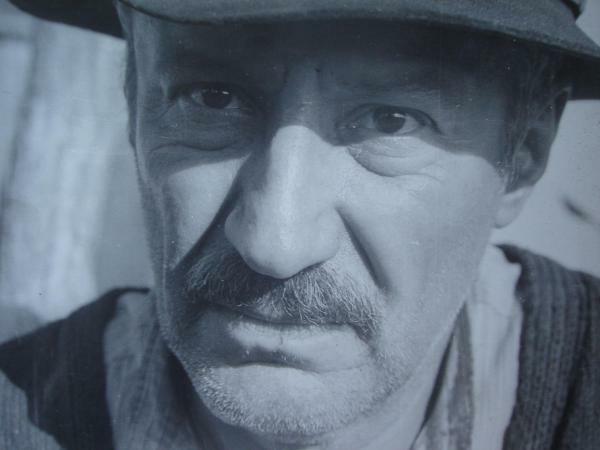 To make this already super cool line-up even cooler, we’ve also invited a long standing friend of the Festival - actor extraordinaire Victor Rebengiuc, one of the best loved Romanian artists. He returns to greet his London fans for a special screening of ‘Medal of Honour’, in the Festival Connected Event of Monday 26 November at the EBRD. 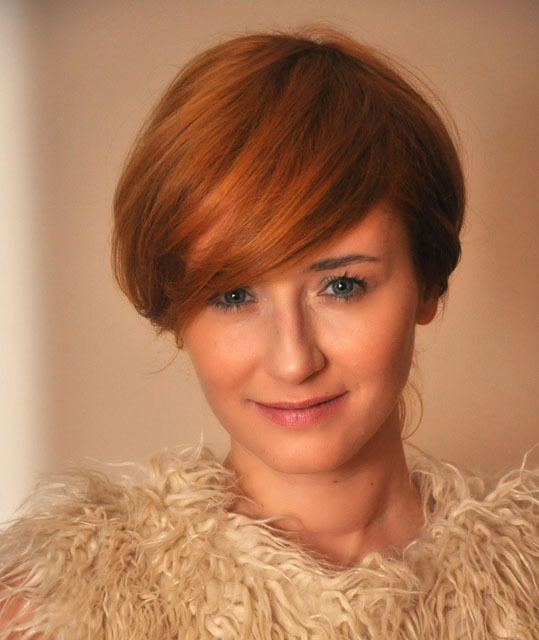 Win your invitation to the exclusive festival party with Romanian movie stars! Some people are having a breather during the weekend. Not us, oh no. Coordinating flight schedules, hotel check-ins and check-outs, and general administrative work? No efforts are spared. But it’s no effort at all because we know this Festival will be the best Romanian experience of the year in London. Check out www.rofilmfest.com for programme details, photo galleries and more. Today was the day when all things fell into place: we began the delivery of the Festival brochures. It all started early in the morning with a discussion on the optimal course to take for the delivery. Then, together with my good friend Eugen, a peerless driver, we went on the road of Festival promotion round London. The first stop was unplanned, when, while stuck in traffic in Harlesden, we noticed the Dracula café and restaurant, and decided on a quick visit to leave some flyers. The owners were so kind as to accept them and agreed to hand them over to their customers. 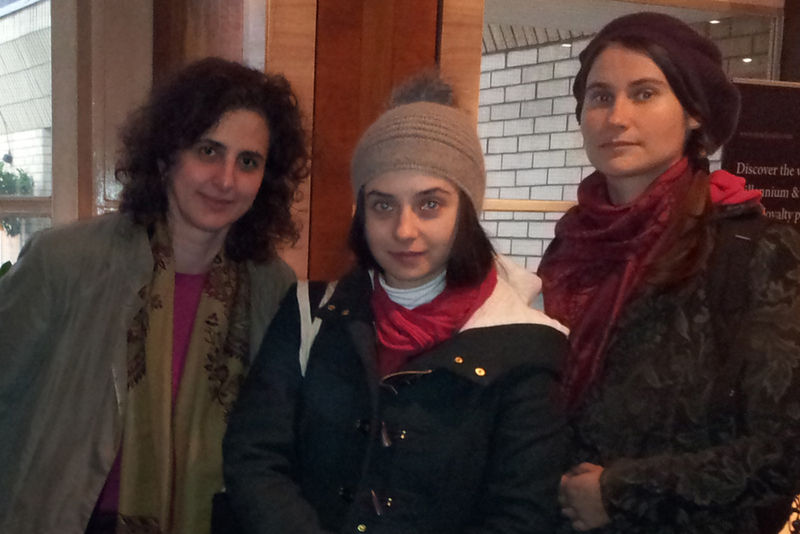 ... where we were received with enthusiasm for the festival project. We continued to the offices of Front Row Sponsors, the building company EuroTop and Levenes Solicitors, where our advertising materials were also well received. O2 and EBRD - The European Bank for Reconstruction and Development followed. 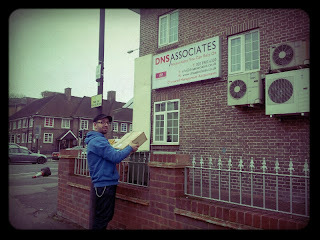 And then we made our way towards the offices of Lycamobile in Canary Wharf, from where we started towards Central London. And what a very nice surprise waited for us at Renoir! 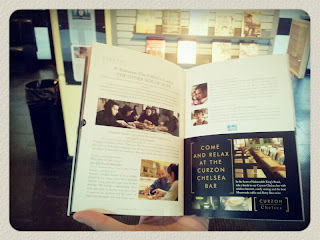 Our friends from Curzon Cinemas posted the Festival on their canopy - as can be seen below. It warmed the cockles of my heart, really. Just look at it - makes you feel warm inside to see this. I am sure you'd like to see the films in the Festival too. 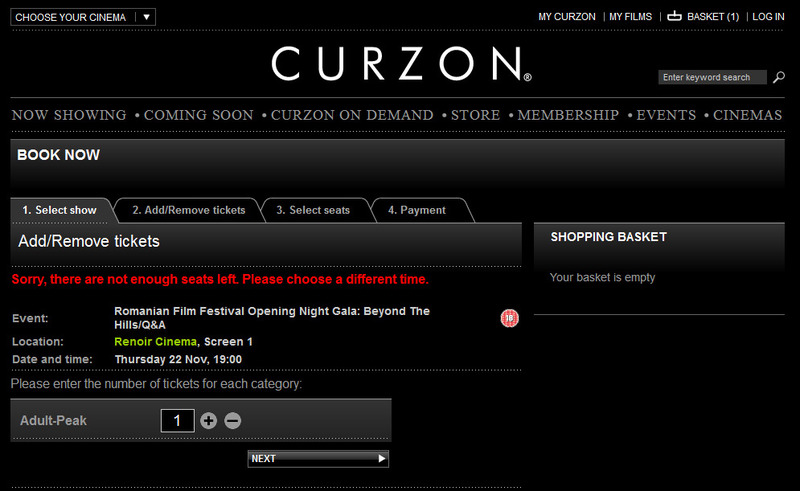 The Gala Screening of Cristian Mungiu's Beyond the Hills is sold out (I know, wow!?! ), and the other films are selling well too. Book your tickets now! 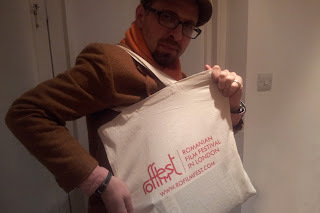 You can buy them in person at the Renoir (The Brunswick, London WC1N 1AW; Tube: Russell Square), online on Curzon Cinemas’ website (http://www.curzoncinemas.com/events/f1uqf/romanian-film-festival) or by phone at 0330 500 1331. I am now going to let you in a big secret: together with our sponsors, we are preparing a nice surprise for the Festival viewers. This is all I can reveal now. Returning to the topic of Festival running around, I wanted to say that we are now at that point when we distribute the printed programmes. We have a good number of them, and they are now at the Renoir and other select locations. 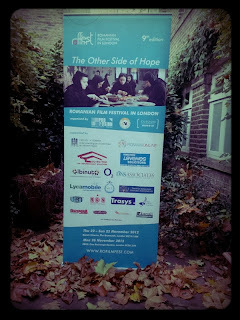 The Festival also has beautiful pop-up banners. Here is an advance preview. It's a lot of work to advertise such an important event, and it's normal to get around convincing literally anyone to come and see your films. "You do understand this can't fail to move you, don't you?" I mentioned earlier that the Festival screenings are selling well in advance. There’s nothing easier than booking your tickets. 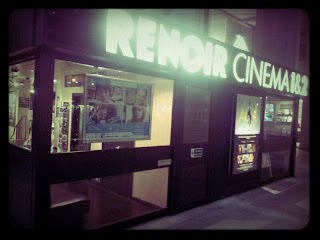 You can buy in person at the Renoir (The Brunswick, London WC1N 1AW; Tube: Russell Square), online on Curzon Cinemas’ website (http://www.curzoncinemas.com/events/f1uqf/romanian-film-festival) or by phone at 0330 500 1331. Once again, a busy and exciting day before the start of a festival. Not too many people know that working on film festivals is not just an office job, and that it also involves lots of running around. Today’s been that sort of day – and I’m not complaining. The large size posters of the Festival, those that go outside the cinema, came out of the printers’ today, and the best way to get them at the cinema is to pick them up yourself - which is exactly what I did. The upside to this is that you get to meet face to face with the people you are in touch normally by phone or e-mail, and have a little planning chat while the posters are displayed (call it a watercooler moment, without the water). This would be the time and place to say a big thank you to Curzon’s Laura Kloss and duty managers Sean and Phil for being so cool about it. On the other hand, it is quite exciting to see your work displayed and (hopefully) appreciated by people. Call me a softy, but I always get weak knees when the Festival posters are put up. Looks rather nice, doesn't it? 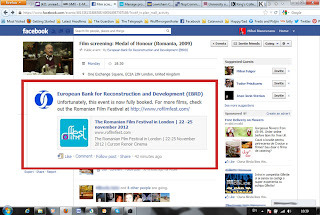 Another very exciting thing that came to pass today was that the Festival’s facebook page (Facebook.com/RoFilmFest) not only reached 1,000 Likes, but went above this mark. Here’s to going stronger and reaching 1,500 by the time we start on 22 November with the gala screening of Cristian Mungiu’s amazing Beyond the Hills, at the Renoir Cinema in Bloomsbury. Since we are talking about this, a little bird told me that the Gala Screening is now completely sold out! Congrats and a great cheers to everybody who bought their tickets in advance. It goes without saying I am pretty chuffed about this, but I can’t help feeling a bit sorry for all our friends who will not be able to be with us for this event. My gracious source also informed me that the other films in the Festival, which are screened at Renoir, are also selling fast – Principles of Life by Constantin Popescu (Fri 23 Nov), Everybody in Our Family by Radu Jude Sat 24 Nov), and Periferic by Bogdan George Apetri (Sun 25 Nov). They are all excellent films, chosen with great care from a pool of great new Romanian films, and they are well worth your attention. 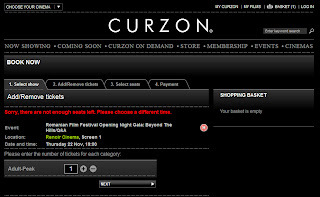 There’s nothing easier than booking your tickets in advance. 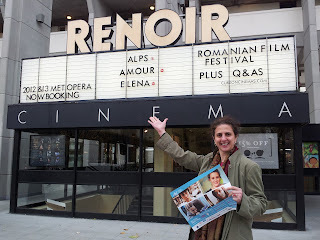 You can buy in person at the Renoir (The Brunswick, London WC1N 1AW; Tube: Russell Square), online on Curzon Cinemas’ website (http://www.curzoncinemas.com/events/f1uqf/romanian-film-festival) or by phone at 0330 500 1331. 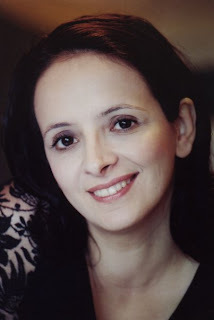 I have to add here that if I'd done some running on this event, it's nothing compared with the huge amount of work put in by the Festival Director, Ramona Mitrica - please join me in saying a big thank you to her. There will be more running in the next days, all for a good cause - this year's edition of the Romanian Film Festival in London. See you on the red carpet! PS - It's also nice to see the Festival has a spread in Curzon Magazine (another reason to love this expertly made publication).